This is a home for your holiday, not just a 'holiday home'. You will begin to relax from the moment you arrive to find your beds made up, a fire laid and a tea tray waiting. CLEY is one of the prettiest of the villages which are dotted along the coast, waiting to be explored, and has a magnificent windmill which dominates the skyline. 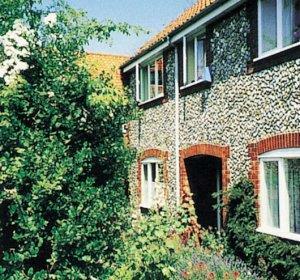 Close by the mill, on a quiet pathway right in the heart of Cley, you will find Skylarks, a modern flint faced cottage built amongst older properties. Passed only by pedestrians, it is just yards from good food shops, eating places and the Norfolk Coastal Path. From M11 junction 9 The cottage is on the A149 coast roadwhich passes through Cley village. Near the windmill taketrack signed windmill and turn right behind the cottages. From Sheringham - 6 miles.